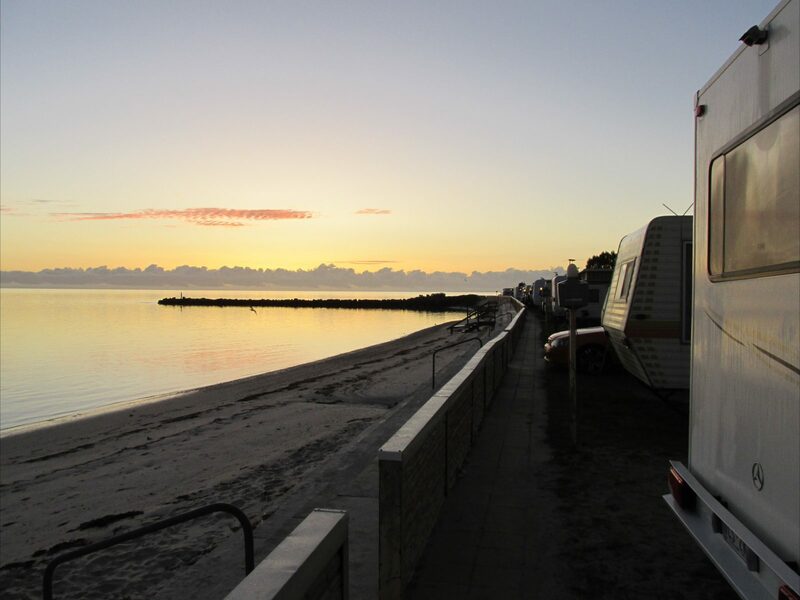 Port Vincent Foreshore Caravan Park, is 192 kms due west of Adelaide across Gulf St Vincent, It is absolute beachfront overlooking the bay and is a favorite holiday destination. 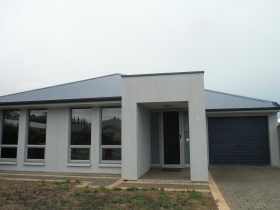 A warm friendly park centrally located in town within easy walking of all facilities. Its unique position on Surveyor Point, giving access on one side to a beach that is excellent for swimming and other aquatic activities, and on the other side perfect for fishing, crabbing and bird life observations. 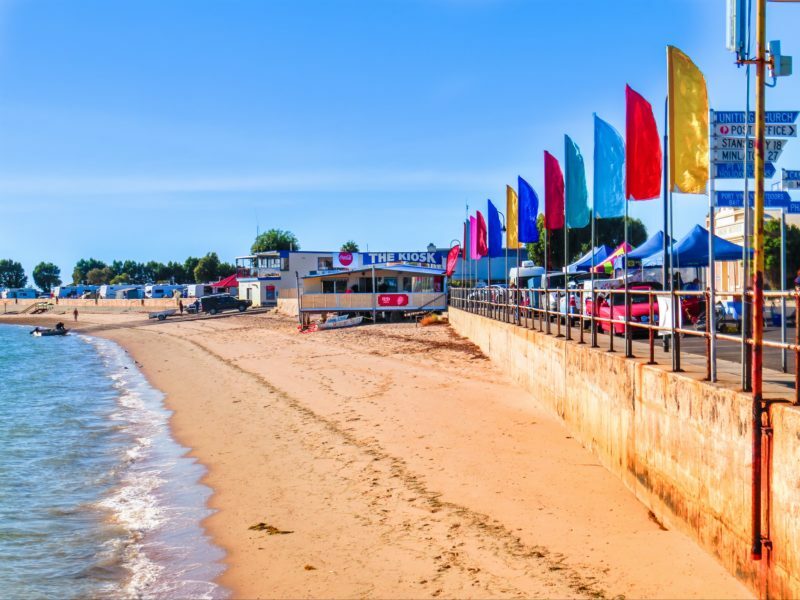 This stunning location offers loads of water activities, modern amenities, camp kitchen, kids play zone plus free movies ‘under the stars’ to top off a holiday. 5 minutes walk from town to local hotel, cafe, kiosk and all other shopping amenities. 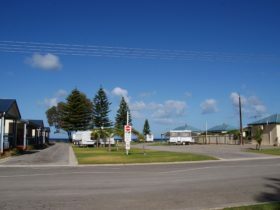 The park is an ideal place from which to explore the peninsula, from the historic Copper Coast to the rugged and spectacular southern tip including the Innes National Park. 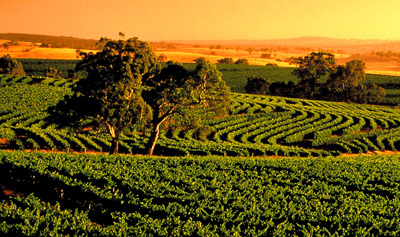 It is also central to experience the great views along “Walk the Yorke” walking and biking trail. Strong community involvement and warm hospitality are reflected in this park’s reputation. 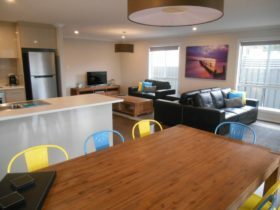 Absolute beach frontage, two bedroom ensuite cabin with one queen size bed, two bunk beds, lounge and all cabin facilities. Linen supplied for main bed. 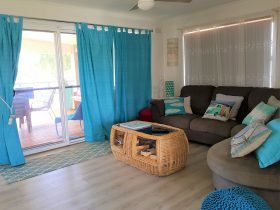 Absolute beach frontage, two bedroom spa cabin with one queen size bed, one double bed, one single bed, lounge, ensuite with spa bath and linen for queen size bed. 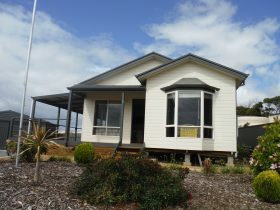 Absolute beach frontage, modern cabin which is fully self contained including all linen. There are two deluxe cabins, one can sleep six (two sets of bunks in second bedroom) the other sleeps five (with a trio in the other bedroom). 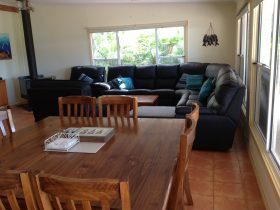 It has a main bedroom with ensuite, the bed faces large windows that gives you the sunrise and 180 views of the beach. the 2nd bedroom is a large room with a queen size bed and a single bed, the 3rd bedroom has a bunk and a single bed.